A water heater is a utility that uses thermodynamics as a means to heat your water. Water heaters provide hot water for basic amenities like bathing, dishwasher, laundry washer, cooking, and even space heating. It is a very important component to living comfortably. Water leaking from the heater, etc. Water heaters in general tend to break down as they get older, this is due to wear and tear. This can also cause the components that heat the water to stop working. 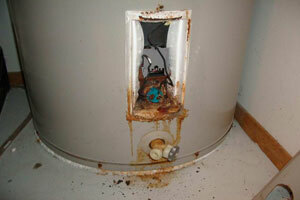 Sediment buildup and corrosion are common occurrences when looking at a used water heater. There are also issues that are associated with the type of water heater you are using. Generally there are two kinds of water heaters; gas and electric, our plumbers are experienced with repairing both types. So if water heater problems are keeping you up at night you should think of calling LA Affordable Plumbing to help put your mind at ease, we can repair if repair is viable otherwise we can replace your water heater.